The word detonates a frenzy of emotion and debate. 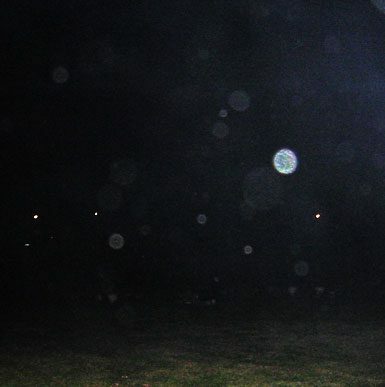 Are the orbs that mysteriously appear in digital photographs merely flash backscatter from dust and mist or lens flares and reflections — or is it concrete proof that spirit beings DO exist? On the other hand, are all of these answers simply naive? I like my Transient Anomalies to affect our environment, even if only temporarily. We all know that UFOs and UFOnauts, monsters and cryptids, Men in Black and “Little People” can be as real as you or I one minute, turn translucent then transparent an instant later, then be gone just-like-that gone in a flash. Sometimes they seem to exit through unseen doors. Unless they leave behind forensic evidence, it is as if they never existed. So what turned my attention to orbs, you may ask? Long story short, the crux of this article centered on a nocturnal visit of a geometrical “orb” formation that Tonia described as playful and emanating a feeling of absolute love in January of 2007. This prolonged “orb” visitation resulted in no less than forty-eight sequential photographs. According to the witness, this all happened very fast and so she got what she could. She thought she was communicating with it! As a photographer, I was not immediately impressed. As an investigative researcher, I felt compelled to ask the hard questions. I was very concerned that, despite minor changes in the luminous intensity of the “orbs,” the basic geometrical shape of this “orb” formation never drastically changed from picture to picture in the photo spread. The “orb” formation seemed to be always a nearly identical vertical chain. Why were there no horizontal chain formations? Why no individual orbs? In addition, this mysterious “orb” formation nearly always appeared on the right-hand side of every published photograph despite where the camera was being aimed and despite the obvious differences in camera-to-subject distances. Why did this “orb” formation not appear on the left side in any of the published photographs? How did the photographer know where to aim her camera? Did any of the photographs taken during this wondrous and rapidly unfolding event NOT show any “orbs” at all? How could she manage to capture this same “orb” formation in every single photograph that night no matter when or where she aimed her camera? Think about this for a moment! With everything happening so fast, the photographer was somehow snapping off picture after picture all around the room: some shots high, some shots low, here and there, right and left, some up close and some not… and yet, these “orbs” always magically appeared on the right side of every photograph. Where were the technical details about the make and model of the camera used? What camera settings or programs were employed? Why made Tonia thought she was communicating with it? Communicating how? What did she see? What did it say? “I clearly see your point of view and explicitly agree with your professional opinion, given the limited facts provided for the incident that happened in January 2007. If I had not been there myself and experienced what I had, I would objectively feel the same way. So just to add a bit of clarification to the implied details below and to also offer some extra technical insight, here is some additional info: The camera I used was a Casio Exilim model #EX-S600. I have owned and used this camera for two years. I have the menu set on a low resolution of 2M vs. the 6M capability to conserve memory space. I also typically use the flash at night, which is what I did in this particular case as well. The camera has a red-eye function which I rarely use. Both the White Balance and ISO are set to AUTO and all filtration settings were OFF. “In January, I was in my bedroom and had an experience which took place for over an hour. I was not quickly trying to snap whatever photos I could while this was happening? I had felt a presence in the room and had taken 278+ photos of the experience, which 48+ were able to translate the object clearly. I used the word ’sequential’ in the written text to imply that the photos were ALL taken on the SAME night, ALL during the SAME experience. They were not ’sequential’ in that ALL of the photos that were taken in sequence contained this object in every picture. Obviously this would lead to a suspicion that there was something on the lens.Or ‘hair in the gait’ as the industry camera ops would say. This object faded in and out in intensity and many of the photos taken had nothing in them at all. To my dismay, I deleted all the photos in between, and many others that only showed the object very faint or transparent. At the time, I was not thinking about future research or publishing aspects. It was simply a documented event of my own record, to be archived away with the other experiences I have had for my family to share. These images were the ‘first’ and the ‘last’ of its kind to be taken with this camera. 1) The Kodak EasyShare C713 easily passed the “television remote test” offered by orb-catchers as evidence that this camera is sensitive to and will record the vital near-infrared light emitted by common remote control devices. They believe that near-infrared light and the frequencies very close to it are what make these normally invisible orbs visible to digital cameras. 2) I have, thus far, rarely captured orbs during my nocturnal photographic excursions through local cemeteries and haunts. One explanation for this might be because, as an experienced photographer, I habitually watch out for any obvious potential reflection hazards that spoil pictures. Another reason might be that, discounting drizzle, fog, or the occasional flying insect, perhaps these “false orb” hazards are encountered less frequently than the debunkers anticipate. Notice that I never said that orbs never showed up in my photographs. 3) I found it quite interesting to observe that when I have taken night shots in quick succession (with the same camera, from the same location, and aimed in the same direction) so-called orbs will not appear in all the photos in the series. One image will display orbs. The next photo, taken one minute later, will be completely devoid of anomalies. However, my meager results pale in comparison to the digital pyrotechnics published in The Orb Project by Miceal Ledwith and Klaus Heinemann, First Atria Books/Beyond Words, 2007. Either co-author Miceal Ledwith, a theologian, had hidden accomplices spraying the atmosphere above his property with a fine mist of God-knows-what as he snapped dozens upon dozens of nocturnal out-of-doors flash photographs or he has succeeded in documenting a truly amazing phenomenon. Either this is a hoax or it is not. Lisa Braun Dubbels, Catalyst Publicity and Promotion Group, gave a review copy of The Orb Project to me, when this book first appeared in 2007. Permit me to beg the understanding of all parties concerned. I concede that some orb photographs appear to represent something unknown and unexplained. However, whether that something represents a divine intelligence that desires to communicate with us is not yet a matter of fact. Miceal Ledwith and Klaus Heinemann have my attention. I invite everybody to study their efforts and replicate their findings. As an investigative researcher, I stand ready to ask the hard questions. Posted in OrbsTagged orbcommentLeave a Comment on 2007: Orbs!